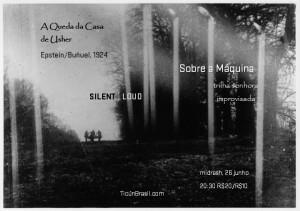 RIO DE JANEIRO, BRAZIL – On Thursday, June 26th, the SILENT|LOUD event returns to Midrash Centro Cultural in Leblon to present a screening of the 1928 silent film, “Fall of the House of Usher”, with the band Sobre a Maquina and saxophonist Alexander Zhemchuzhnikov providing a live soundtrack. 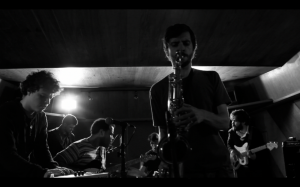 The Brazilian band Sobre a Maquina with saxophonist Alexander Zhemchuzhnikov will provide a live soundtrack, photo by SILENT|LOUD. Inspired by the early 1990’s “Loud Music with Silent Films” series held in Manhattan’s Knitting Factory, the first Brazilian edition of SILENT|LOUD took place at Audio Rebel in Botafogo, a little over six months ago, on December 13th 2013. “It combined works from 1920s, the most experimental period of Russian cinema, with today’s improvised live Brazilian music […],” Minkin explained. For the screening on the 26th, saxophonist Alexander Zhemchuzhnikov will return with his band Sobre a Maquina to provide the live musical accompaniment. Russian born and currently living in Rio, Zhemchuzhnikov is critically acclaimed for his compositions and his participation in avant-garde Brazilian musical groups, which also include BIU and Bonifrate. Flyer for the SILENT|LOUD Surreal Cup Edition, photo by SILENT|LOUD. The film selections for the series are made by O Globo film critic Ruy Gardnier. Gardnier, also founder of Contracampo and Camarilha dos Quatro, personally introduces the films before each event. Previous screenings have included Rene Clair’s 1924 film “Entr’acte”, Buñuel’s 1928 work with Salvador Dalí, “Un Chien Andalou”, and “The Golem: How He Came Into the World” a 1920 German film co-directed by and starring Paul Wegener. The 1928 film “Fall of the House of Usher”, by Jean Epstein/Luís Buñuel, is a French silent horror film which used avant-garde techniques, including blurs and optical distortions, to create haunting and engaging visual spaces, to retell the 1839 Edgar Allan Poe short story. This will be the last screening of the current series but the program is scheduled to begin again after the participating musicians return from touring and playing festivals overseas. The edition on Thursday will feature two dedications to; the new record label Quintavant and Oleg Sentsov, a Ukrainian film director currently jailed in Russia.